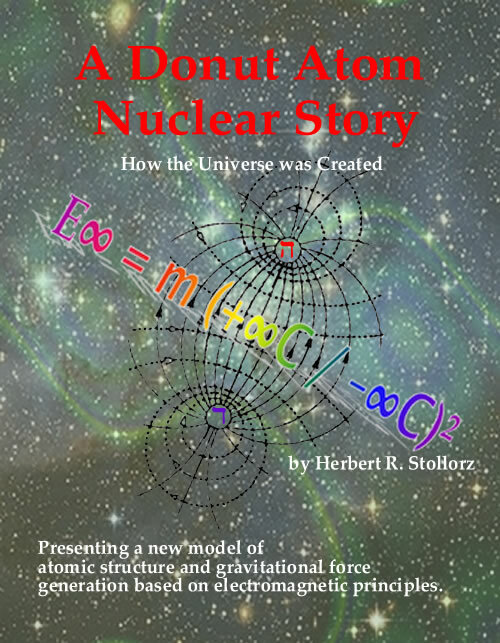 The front cover of my Donut Atom book exhibits the parabolic time dimension formula suspended between two Hebrew letters, Heh (h) and Daleth (ד). These letters show a polarized exchange in an energy equation that connects the metaphysical-spiritual universe dimension and is invisible to mortal eyes. It is joined to the material side of creation but still controlled by the laws of physics. This diagram basically illustrates the laws of a transformer that reduces or converts infinite energy to a lower level. It is empowered by same forces we see at work in DNA, which is organized by complex intelligence. In a nutshell, my Donut Atom Model spells out an unusual story that has never been proposed in the halls of education. The book’s front cover focuses on the two Hebrew letters Heh (h) and Daleth (ד). They are connected by electromagnetic lines of force. Looking at it from a perspective of simple strokes to make the letter, both letters have a single horizontal line at their tops. In the ancient Semitic (Arabic or Hebrew) world, anything above the horizontal line is symbolized as God - the divine Creator, the invisible One God. Nothing can or will exist beside God. There are no symbols above the line, but below it, a vertical line descends along the right side in both letters. It represents the divine extension of another world emanating from the One God. It signifies the new beginning stated in Genesis when God created. In the Heh (h), there is a second, unconnected vertical line under the horizontal line on the left side. It sits in mirror image to the connected line on the right just as the earthly dimension of this time is an image of the heavenly Heh dimension. The first verse in Genesis announces God’s Plan for Humanity on earth in the midst of Heaven. The Bible provides instruction and answers the thousands of questions intelligent people ponder and eventually ask. The Hubbell telescope, mankind’s wonderful “eye in the sky” has revealed to our ever curious species where Heaven begins. Its telescopic lens continues to probe ever further. God, in Genesis gets straight to the point by describing how this universe is fuelled by (∞) infinite light invisible to us. Human eyes are calibrated to see only the colors of the rainbow – the seven-spectrum frequency. Infinity expands far beyond gamma-beta rays and will be explained later. Invisible gravity is another form of infinite energy. The infinite light is cycled in God’s creation within an embedded parabolic time dimension. This mystery is fully explained in my Donut Atom book. Theologians believe it must refer to the water in clouds (above) and the ocean (below). But misunderstanding the Hebrew Alphabet Number system (HANS) causes problems when deciphering God’s creation story from a scientific perspective. Many theologians still adhere to false doctrines taught since the Middle Ages. HANS divides it into two dimensions - Heh (h) and Daleth (ד) - to provide a better understanding of God’s creation. Looking closer at what the ancient Hebrew letters reveal, we find the vertical line descending from the right end of the letter (h) Heh’s horizontal line. It is mirrored by, but not connected to, the vertical line on the left side, which is separated from the horizontal line. As the unconnected left vertical line is a mirror image of the right, the earthly dimension of this time is a separate, reverse image of the heavenly Heh dimension. The material Daleth dimension represented by the left line is separated from, but still indirectly connected to, God via the infinite gravity energy embedded in every atom. I call it the (+One) force because the natural universe is mirrored in the invisible heavenly Heh dimension reality. The two vertical lines (||) in the letter Heh express these two dimensions. God is now experienced or known visibly through His creation which is identified with the second Hebrew letter “duality” or Beth, meaning ”create”. It is located below the horizontal line as it is dual in nature just as God, the Father and the Son are illustrated in nature with examples ranging from the caterpillar-butterfly life cycle and any two-cycle seed system. The macro worldview, an expanding and accelerating-decelerating universe in the light-time dimension, will be further investigated and explained in this book. In Hebrew, the Daleth (ד), represents the concept of “this world-in this time.” It does not have a left vertical leg making it incomplete or only one dimensional. The material world was made by God as represented in the letter’s one horizontal line. When the left vertical line in the Heh (h) is connected to the horizontal line above it forms Chet (x) representing the age of judgment and transition to the end. Semitic letters and words flow from right to left just like hieroglyphic picture symbols; therefore, the addition of a short horizontal line progressing from the left vertical line (towards the right) joins together into one to become the last Hebrew letter, T=Taw (ת) meaning “the end of time in eternity.” It also symbolizes the age when all creation, material and spiritual / metaphysical, will be united under God’s direct rule previous to the creation of a new Heaven and new Earth in the coming Jod dimension. I will end my story by comparing the first Genesis report with the Donut Atom story and exploring how on the third creation day plants and vegetation grew without the sun, which only appeared on the fourth day. This can now be explained due to the appearance of Infinite light. It was scaled down by a time dimension on the first day, which has now been scientifically explained in this, my Sixth Babushka book, A Donut Atom Nuclear Story. In it I prove that a higher speed-of-light existed in prehistoric times . We can measure it today. My conclusions are based on the fact that a larger concentration of atmospheric oxygen causes larger cell sizes as seen in fossilized bone structures. This observation translates into two or three times the energy fuel for the ancient biosphere. You can find it in geology and in coal deposits as well as in the many bubbles embedded in amber. The only explanation for this fact is that the initial speed-of-light had to be faster than at present, which consequentially resulted in the accelerated growth of ancient plants and animals. Being infinite in strength, the bio-conversion process when reduced by a parabolic time dimension could have been as short as reported in Genesis - a 24-hour “shamayyim” (Heavenly) creation day. This would be triggered when God activated the dimension of time and put his plan in motion for people to appear in 4068 BC. Currently accepted science can only postulate an opinion that projects this timeframe as billions of years. They have no supporting facts. My Donut Atom model ends this confusion. For example, light was reduced exponentially on the 4th day within the dimension of time, thus converting infinite light into an less intense and usable fuel source. This occurred when God placed the Earth in the Milky Way. Subsequently, we were pulled into the “universe” of our solar orbit. Galileo got into serious trouble when he pointed this out to the establishment of his time. In his infinite wisdom, God used the finite sun as another energy transformer so that growth rate of vegetation would decrease. By using a lower energy level it is much more useful for mortals. This is the principle by which a million volts is reduced by a transformer on a telephone pole to the 110 volts that every house requires and utilizes. The growth rate of vegetation was stepped down by reducing the energy input by lower light intensity. The speed-of-light had slowed down to about 186,000 miles per second as measured in 2009. But light speed was different in ancient times as can be seen in geology and coal deposits using a microscope. Like a dimmer switch used in our living-rooms set on low, light has slowed down. Dr. Einstein wondered about the energy flywheel in the material universe (Daleth) losing inertia according to the laws of physics so that everything is actually slowing down. This concept is proven in the greenhouse technology to those scientifically inclined. Longer or increased light exposure makes for faster growth. When Daleth ends in the parabolic time curve, the point in time is represented by Taw, which is the restoration accomplished by the unification of the dual Heh-Daleth polarities. The Heh and Daleth letters will disappear and merge into Taw linked to HANS will then be obsolete, too. The good news is that the parabolic time dimension will be transformed into the Jod dimension when Jesus returns to earth and restores God’s Kingdom on Earth. This event will add more light again like during the first creation days. Bible prophecy points out that people will again live to be hundreds of years old like Abraham and his children in the Old Testament. This process happens gradually but can be seen by viewing many examples throughout the world. You don’t even need a doctorate degree in theoretical physics to discover it. Just be a tourist and examine some of the ancient castle door frames that still survive from our past. If you notice, they are much smaller than those used today. If you don’t notice, you be rewarded with a nice bump on your head. Also, the steel armor worn by knights was much smaller than could fit an average person today. We are growing larger again. It also connects to global warming. God’s presence on earth will make vegetable grow faster again so that more food is available to feed the growing third civilization population. That is projected by prophecy in the Bible - now explained scientifically in the website in our Forum Pearls. The reversal has already started. People are getting bigger if you compare the armor suites of the Middle Age or the smaller doorways of ancient castles. Notice increasing global warming. Check out and understand why the IPK world standard platinum kilogram is becoming heavier, too. Many more discoveries are showing up that cannot be explained by standard theories. Read all of the Babushka concept books adding to our knowledge horizon. It directly links to the IPK world-standard platinum kilogram which is becoming heavier. Read all of my Babushka concept books to add to your knowledge horizon. The Bible creation story actually ends in the last pages of Revelation with a redemptive plan for a defective and broken universe that is no longer useful. It is as static as the Heh-Daleth dimension - wrecked and polluted by Satan’s rebellion in 4488 BC. It will soon be transformed into a new universe dimension finalized in Jod. This will ensure that the math-energy equations come out correctly. The Creator has promised a future without death or pain. Satan’s school of evil and unjust tyranny will be closed down at the end of the Apocalypse in 2015. That will change human civilization. For the first time, people will live in peace and prosperity without wars. It will be a good life for everyone. After this thousand-year age of peace, everything will utterly pass away into a black hole. The time has come for another universe with much better with life cycles. The Saints will emerge to the liberated life like butterflies do from cocoons. The Bible predicts a totally different creation, much larger and more beautiful for those who qualify for the eternal life offered by Jesus Christ. God said there will be no more death, sickness and pain, He will then, personally, wipe away all of our tears to start life over again on a different planet prepared by God. Go back to the book home page and index. Go back to Apocalypse Prophesied 2008-2015.